Queen’s Valley Reservoir is owned by Jersey Water and is kept open for the enjoyment of the general public. The reservoir is the newest reservoir in Jersey and was completed in 1991. The reservoir is the Company’s largest holding up to 1,193 megalitres of untreated water (enough to supply Jersey with water for approximately 48 days). The reservoir is in fact two reservoirs with the lower section being by far the largest. The wall is a rock filled embankment with a bituminous concrete core. There are several walking routes around Queen’s Valley Reservoir, the full circuit is 1.9miles (3.1km). Water feeds into the reservoir from its catchment area of 516 hectares (1,275 acres) which extends as far West as La Grande Route de St Martin and nearly up to St Martin’s village in the North. The reservoir is connected to the Company’s raw water transfer main which allows the Company to move water between its reservoirs. This means that when one reservoir is full, the water can be transferred to another reservoir allowing the first one to keep filling. This way we make sure that every drop of water is stored until all reservoirs are full. The large tower near the dam wall is where all of the water is collected from. The tower has a series of inlet pipes at varying depths through which water can be collected for transfer to the water treatment works. The tower also acts as the overflow in case the water level rises too high – excess water would enter the tower and run safely down a large pipe in to the spillway below the reservoir. 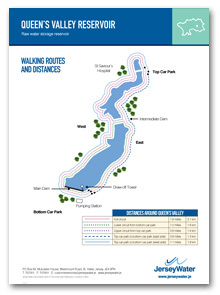 There are several walking routes (click here) around Queen’s Valley Reservoir, the full circuit is 1.9miles (3.1km). The reservoir has a natural wealth of flora and fauna and is home to many species of birds and wildlife. We hope that you enjoy your walk around Queen’s Valley Reservoir. 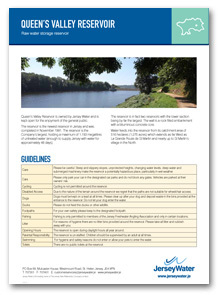 For your own safety, the enjoyment of the reservoir by others and for hygiene reasons please follow the general information and guidelines below. Dogs must be kept on a lead at all times. Please clear up after your dog and deposit waste in one of the five bins provided, that are located around the reservoir. Do not let your dog enter the water. There is one portable toilet by the fisherman’s pontoon.